We took a look at some areas of support and resistance S&P 500 chart last week. As it turned out we could have just focused on the support levels because the market was unable to mount any sort of move higher. Here is the analysis. The S&P index finished the holiday shortened week at 2632 which is just below the October 2640 closing low. This morning the futures suggest a strong open with the S&P up about 29 points to around 2658, and the DOW making a 250 point jump at the start of trading. The 2670 to 2680 area is the first area of resistance we see on the S&P 500 daily chart. Above that would be the 2692 level and then a bit of a resistance vacuum until 2733, which was last week’s high. If the market was able to sustain a move back up to 2733 and break through that level, then the real work begins. The zone delineated by last week’s high wicks at 2747 and the 200 day moving average, currently at 2760, should present strong resistance. 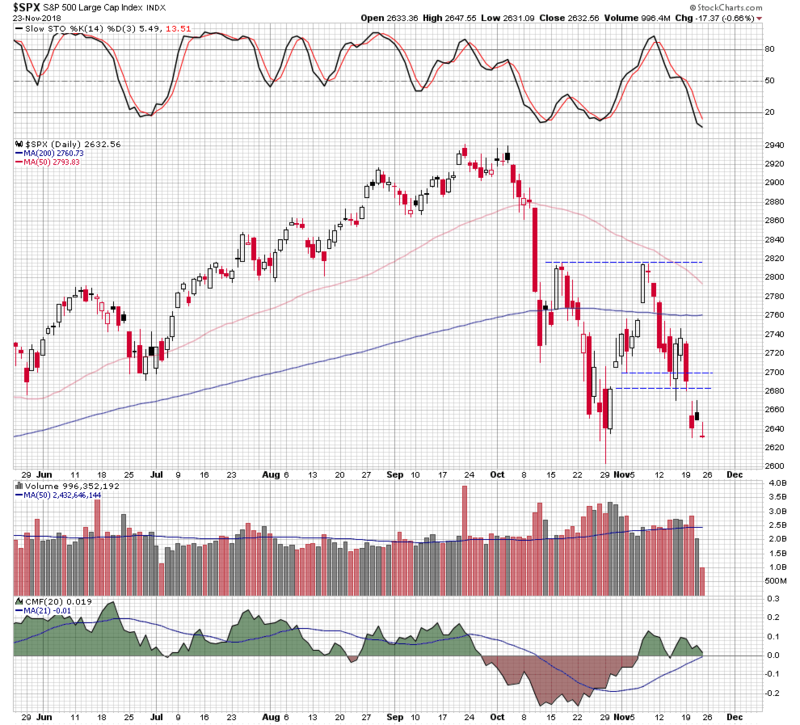 In fact, the 50 day moving average is dropping and could become reinforcing resistance, in the process making a “death cross” below the 200 day average. 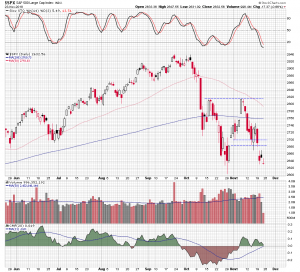 The bottom line of the analysis is that even with this morning’s strong open and supposing another 100 S&P points, the index is still not out of the woods.